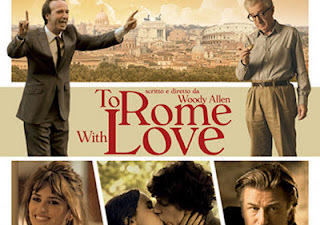 TO ROME WITH LOVE is a rather mediocre, derivative, Woody Allen movie - a portmanteau of four stories, neither of which is especially interesting, well-acted or well-developed. The only real link is that they all take place in Rome - there isn't a link between them - either through the characters or thematically, as far as I can tell. The most ill-fitting of the four stories, by virtue of the fact that it's in Italian and also because it isn't romantic but whimsical-philosophical, centres on an ordinary Joe (Roberto Benigni) who suddenly becomes famous for no reason he can see. It's kind of an inverse Josef K situation - and a wry comment on the fatuousness of modern celebrity culture - and reminded me of early Woody Allen movies where a fantastical idea was worked out to it's ludicrous extreme. The problem is that the story makes a rather simplistic point, and doesn't really take it anywhere. The story I found simultaneously the best and worst features Woody Allen himself back in an acting role, as a cynical retired impresario who puts his daughter's Italian father-in-law on the stage. Problem is, this simple mortician can only sing when he's in the shower. It's meant to be fantastic and funny but fell rather flat for me. The only redeeming feature was Judy Davis, cast once again as Woody Allen's wife. She gets the only really funny one-liners of the whole film. Next up, we have Jesse Eisenberg playing a young Woody Allen character - an unsatisfied cynic who cheats on his earnest girlfriend (Greta Gerwig) with her flighty, flirty best friend (Ellen Page). I really hated this segment, mainly because the romantic triangle is well-worn in Woody Allen; second, because I thought Ellen Page was woefully miscast as the femme fatale; and third, the conceit of having Alec Baldwin play a devil on the shoulder of Jesse Eisenberg's character also just fell flat. Finally, we have the weakest story of the bunch. A young Italian couple lose each other - she flirts with an elderly actor and he gets entangled with the cliché Woody Allen brassy whore (Penelope Cruz.) No laughs, no insights, no point. All in all, after his recent good run, this is an utterly worthless and mirthless movie. We've seen all this done before - and better. Most of all, it's disappointing to see Jesse Eisenberg wasted on such poor material. He's an actor who seems to have been playing Woody Allen all his life. TO ROME WITH LOVE opened earlier this year in Italy, the USA, Argentina, Brazil, Norway, Uruguay, Belgium, France, Israel, Russia, Canada, the Czech Republic, Georgia, Iceland, Mexico, Denmark, Hong Kong, the Netherlands, Poland, Sweden, Germany, Hungary, Finland, Greece and India. It opens this weekend in the UK, Ireland and Lithuania. It opens next weekend in Portugal, Singapore, Estonia and Spain. It opens on September 28th in Taiwan and Turkey; on November 9th in Bulgaria; and on December 20th in New Zealand.